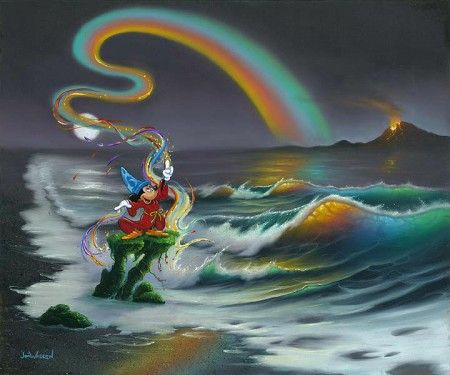 Jim Warren Signed and Numbered Hand-Embellished Giclée on Canvas: "Mickey Colors the World"
About The Artist: Jim Warren is one of the most creative and prolific artists of our time. If you are not familiar with his name, you have undoubtedly seen his work. His fine art paintings and personalized portraitures have been commissioned by a clientele list that includes world-famous celebrities and prominent business leaders, and his collaborations with marine life artist, Wyland, are widely acclaimed. His paintings have been seen around the world on billboards, large outdoor murals, set props for TV shows, and Fine Art Galleries coast to coast now carry his works. Jim has also illustrated over 200 book covers for major New York publishers, including titles from authors such as Arthur C. Clark, Clive Barker and Robin Cook. He has created collectible movie posters and magazine covers, numerous album and CD covers including the Grammy award-winning cover for Bob Seger's album, "Against The Wind." Born and raised in Long Beach, California, at age seven Jim knew he wanted to be a painter. However it would be several years before a pivotal event helped shape the developing, self-taught artist's career: the day he picked up an issue of "Life Magazine" and discovered Salvador Dali. Looking at Dali's paintings in Life, Jim realized his own art could be anything he wanted it to be, and, while influenced by Dali, Norman Rockwell, Andy Warhol, Rembrandt, Magritte, Monet, Peter Max and others, he set out to further develop his own unique style of painting. In 1986, Jim was commissioned to create a painting for another gifted individual, world-renowned recording artist, Prince. Jim was given very limited information on which to base the painting other than a one-page sheet containing 13 instructions such as, "a fat man hugging a tiger," "two men with hair shorter on one side, playing the tambourine." Jim was instructed, "use your imagination," which, of course, he did. Upon completion of the painting he was told that Prince loved it. Currently, Jim focuses primarily on his fine art paintings. Yet in spite of the strong, ongoing demand for these works, he has managed to find time to create two books: "The Art of Jim Warren," and "Jim Warren, Painted Worlds." Both contain clear and colorful representations of his works, many of which combine, as Jim has stated, "the effect of the real mixed with a touch of the unreal, to make you feel as though you're actually seeing something that in reality couldn't possibly be. Although Mother Nature is my favorite art director, I do take artistic license to create environments of my own." When questioned by an acquaintance recently concerning what aspect of his work gave him the most pleasure, Jim replied, "the letters and emails I get from people around the world who say they have been touched in some way by my paintings. The fact that my art can create an effect like that for some people, and act as a positive influence in their lives, means a great deal to me." Such is the Art of Jim Warren.